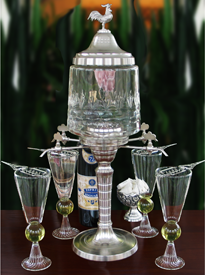 Your Absinthe Fountain Set will be the center of attention for all of your social gatherings. As such, you'll want one that is beautiful, functional and just right for your taste and decor. Learning a little about absinthe fountains before you buy will assist the process of finding that perfect piece for your absinthe collection. Most Absintheurs have tried mixing absinthe using water carafes or an absinthe dripper or brouilleur. Both of these work well for mixing absinthe. But once you've become familiar with the louching process, you realize a fountain is not only a time saver but will prepare a better tasting drink. Depending on the style and quality of the absinthe fountain you choose, pricing can range from $100 to $1000 so making an informed choice is most important. Let's look at some of the criteria involved in absinthe fountain selection. The number of spigots (or Robinettes) depends on visual aesthetics, intended placement and type of use. Some prefer a 6 spigot absinthe fountain to a 4 spigot fountain as it appears more visually balanced. Conversely, others find a 4 spout more appealing as it is slightly smaller in size on 2 sides due to the lack of extra spigots. ​Height and width are especially important as you will likely display your Absinthe fountain when not in use. Quality fountains add a touch of distinction to any room and most consider them a piece of decor as well as bar ware. Metal and glass style absinthe fountains are much heavier than their all glass counterparts making them very difficult to transport safely. Moving them is not impossible but is much more difficult than the all glass style. If you need to transport your fountain, pay special attention to protecting the glass bowl as they are difficult to replace. Usually far more expensive than an all glass absinthe fountain, metal fountains often become heirlooms and are handed down over generations. ​Little maintenance is required for a metal absinthe fountain. As a matter of fact, a quick wipe down after use is usually all that is required. Most owners do not polish the metal as an acquired patina can lend quite a desirable look. 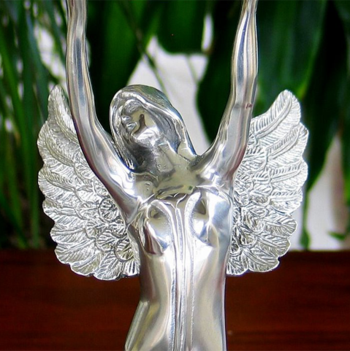 If you do decide to polish your fountain, always use the least abrasive product available such as a polish intended for silver like Maas brand polish. NOTE: All glass absinthe fountains are produced using 2 kinds of glass. Borosilicate and Soda-Lime. Borosilicate is by far superior in strength, temperature resistance and appearance. It is the same glass laboratories use for beakers and test tubes etc. Borosilicate absinthe fountains are also more expensive (2-3 times more costly). Don't be afraid to purchase a soda-lime glass fountain. Just be aware of the tremendous and visually noticeable difference in quality and durability. 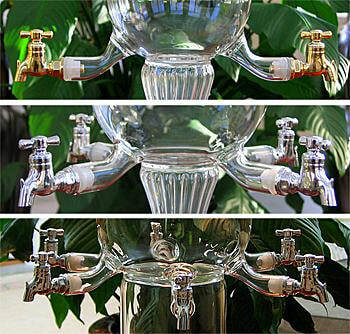 ​Rule of thumb: If you intend to keep the fountain, it is worth the extra cost for borosilicate glass. How to tell if a fountain is borosilicate or soda-lime? If the type of glass is not listed, it is likely soda-lime. If the price is unusually low, it is likely soda lime. If it is on Ebay or Amazon, it is likely soda-lime. CAUTION: There are currently soda-lime glass fountains with on Ebay and Amazon with inflated prices attempting to fool people into thinking they're borosilicate! Always use caution when purchasing from Amazon or Ebay as they have both been saturated with low quality absinthe pieces. Remember, if it sounds too good to be true, it probably is. Lastly, it is usually a money saver to purchase your absinthe fountain as a set. Fountain sets will include the fountain, glasses, spoons and often sugar cubes. The price difference between a fountain and its equivalent set will usually save you a considerable amount of money over purchasing all pieces separately. Just search google for "absinthe Fountain sets".